Everyone understands puppies have behavior problems and need to be taught “the rules.” But what about older dogs who understand the rules but become increasingly unable to follow them? The root cause of behavioral issues in older dogs is often anxiety, which can increase as they enter their golden years. And just like puppies, senior dogs with anxiety simply need patience, understanding, and a few lifestyle adjustments to navigate their world in a happier and healthier way. 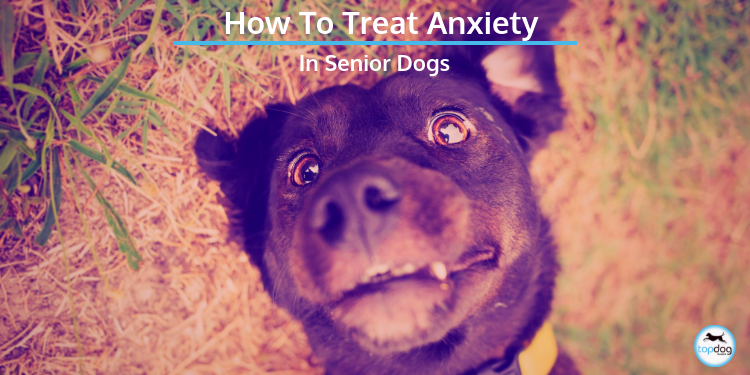 Here are the main ways anxiety manifests in senior dogs, and how you can help. Oftentimes as dogs age, they become more anxious in general. Physically, this may show up as panting, licking, shaking, or pacing. Behaviorally, an anxious older dog might also urinate, excessively lick/bite themselves, or even become aggressive. They may have changes in appetite or sleep (either sleeping more or less), or become clingy, restless, or lethargic. Maintain a predictable routine and environment. Just like senior humans, older dogs are pretty set in their ways and wary of change. Help your dog feel more secure by keeping things in the world predictable, as much as possible. Stick to a daily routine, with regular wake times, walks, meals, playtimes, and bedtimes, so they know what to expect. Don’t vary what they eat too much, move where the toys are kept, change the location of their dog bed, rearrange your furniture often, etc. Of course, life can get messy, but every little thing you can do to keep your older dog feeling secure counts immensely. Separation anxiety is one of the most common behavioral problems in older dogs (and dogs in general). A canine with separation anxiety will become very anxious when they sense their owner is about to leave – often shaking, panting, pacing, or excessively licking. When left alone, they may bark, become destructive, or urinate or defecate indoors. Make the house seem less empty. Anything you can do to “trick” your dog into thinking he’s less alone is beneficial, such as playing the radio or leaving the TV on. You can also leave a light or two on for them if you’re going to be gone at night, so they aren’t left alone in the dark. Switch up your departure routine. Many senior dogs become anxious as soon as they suspect you’re about to leave, for example when they hear your alarm go off in the morning and see you getting ready for work. Switch up your routine so they no longer come to expect your departure, such as grabbing your keys but then sitting down on the couch, or getting dressed for work but staying home. Start with short departures. Many older dogs become worried that when you leave, you’ll never return. You can train them to understand this is not the case by easing into it. Prepare as if you’re going to be gone for a while but leave for only 1 minute. A few hours later, leave for 3 minutes. The next day, try 6 minutes, and very slowly build the duration until they’re able to stay more calm while you’re out. Even dogs that were once friendly as can be with new people may develop stranger anxiety as they age. This can manifest as becoming skittish, placing their tail between their legs, urinating, or even becoming aggressive when approached by someone they don’t know well. Allow your dog to do the approaching. If you have a friend or acquaintance that your dog doesn’t know well over to the house, ask the “stranger” to first allow your dog to approach them. If they do, offer a treat or favorite toy as a reward. Be more obvious. Take care not to accidentally sneak up behind your dog, always approaching in their line of vision. Help them get their bearings with sound cues. Try purchasing a bubbling water bowl so they can find it more easily, or placing bells on your shoes to let them know where you are. With age often comes incontinence, in humans and dogs. Especially if your pup is left indoors during a long workday, accidents become more and more likely the older they get. Help reduce accidents. Increasing the amount of times you let your dog out in the yard will reduce the risk of accidents. And though it may sound silly, a doggy diaper will help your dog go when they need to while eliminating the feeling that they’ve done something wrong. If possible, try to change up your routine so you’re home more, or enlist the help of a neighbor or dog sitter to let them out more frequently. Keep your cool when accidents happen. Remember, your senior dog is not trying to make a mess, they simply can’t help it. They’re already feeling anxious about doing something they know is bad, so avoid punishing them and instead clean the mess up calmly and quietly. Take a trip to the veterinarian. Oftentimes, incontinence in older dogs is the result of a medical condition. A veterinarian can help you identify if this is the case, and treat it accordingly. And finally, remember that your dog takes their cues from you. It’s called mirroring, and the impact it has on your furry friend is real. The more calm and relaxed you are, the more your senior dog will follow suit. So when your older dog breaks the rules, resist the mindset that “they should know better” and remember all they want is your love and acceptance as they face the often scary changes that come with aging. Take the time to relax and play with your pup, no matter how old they get, and do what puts a smile on your face and a wag in their tail.